Metlako Falls is the first of two great waterfalls to photograph along the Eagle Creek Trail (Punch Bowl Falls is the other). Combined with the absolute beauty of the gorge and the perfectly placed waterfall, what makes these falls special is that they appear to shooting out of the side of the rock walls like a water facet. Each day, hundreds of people walk along the Eagle Creek Trail, but few are even aware this fantastic photographic opportunity exists, as the trail down to the viewing area is easily missed. Once you get to the end of the short trail to the viewing area (with metal cables guarding you from the drop-off into the canyon), you are shocked at what you see. 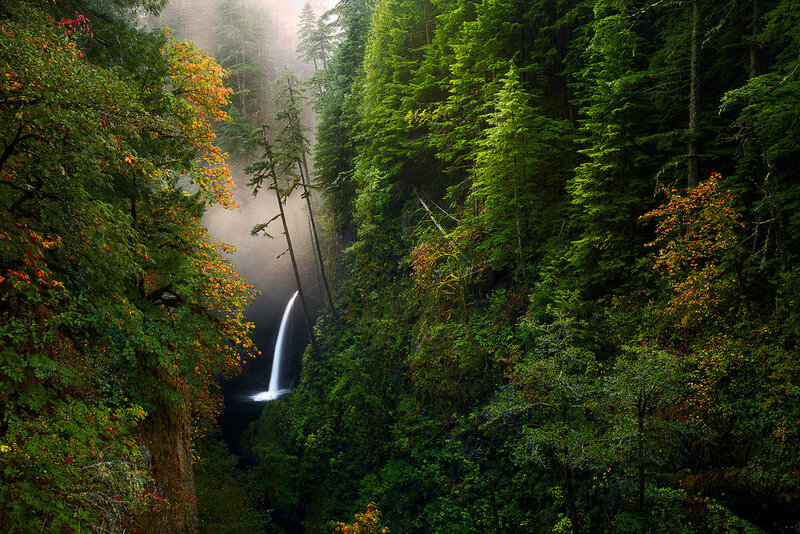 Metlako Falls is a must waterfall to photograph while in the Columbia Gorge area. For those who saw the movie “Wild” with Reese Witherspoon, the Eagle Creek trail is part of the Pacific Crest Trail (PCL) and is only a few miles from the Bridge of the Gods, where Cheryl Strayed ended her journey.